I had the same email, but then received a 2nd email with the revised date of 10/18-10/19. "Minnesota photographer Allen Beaulieu captured Prince's progression from rising star to his ultimate purple superstardom. In Part 1 of Storied, Prince: Before the Rain, Beaulieu tells the story of how he and Prince started working together in the late '70s." That's Awesome! 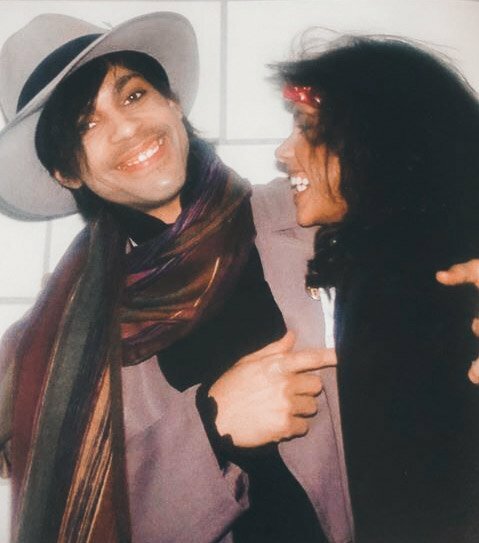 What an incredible experience that must have been to work with Prince during that time. I received the book today .... after almost a years wait from the original delivery date in November 2017. It's nice. Not groundbreaking but nice. can something that already happened be groundbreaking? Technically speaking the event would happen BEFORE it could break anything or be groundbreaking. So the answer is yes. Think about if I drop a glass of milk. I already dropped it but it's not breaking until it hit the ground. Anyway my point was that I don't think most of the pictures are anything groundbreaking news. I love all the different takes for albums, promotions, etc. But hardly something that is "groundbreaking" in the Prince fan world. I love the book! I was just annoyed by some of the small errors and inaccuracies. One of the photos is of Prince and Terry Lewis backstage, but the caption says it's Jellybean? And the instances where the band is referred to as the Revolution, when they weren't known by that name yet, or when the photos of the Revolution on the Parade tour are accompanied by a caption referring to them as the New Power Generation? At one point, the Vanity 6 album was mentioned as having come out in 1984? I know these aren't serious issues, but I still get irked when I see things like this in books or tribute magazines. But I guess not everybody thinks like an obsessed superfan. The photos are amazing to see, though. I wonder did he reach out to people from that time period for assistance? Didnt he know them himself? He was up in the mix. Then why all the mistakes? My book literally arrived as I was reading this thread! The copy I ordered from Amazon arrived yesterday as well (east coast, usa). I havent had time to sit down and read everything but I looked through all of the pictures and they are INCREDIBLE! The book is quite large too. The current price on Amazon is an absolute bargain. I would expect it to cost more. OldFriends4Sale, I would love if you shared your playlist - I also wanted to listen to music from the era while enjoying the photos. All of these photo books need soundtracks! The book came yesterday. So many unseen pics in there, I'm very pleased with it. "Thank you to Special Guest Allen Beaulieu and Minnesota Historical Society for attending #PRNAlumniFdn Alumni Shares Panels @ Capri Theater Saturday. Allen signed copies of 'Prince: Before the Rain' for our guests..."
I just received my book today and I love it! Haven't read the stories yet but the pictures are fantastic! I would agree with IKARYSS about the misidentifying Lewis as Jellybean and calling the Revolution (1986) the New Power Generation. But other than that in addition to some other minor things - this book is absolutely great! The beautiful unseen pics made up for the errors. Who knew Prince took ALL of these pics!? It was rarely any new pics seen of him back then and hard to find. He was VERY guarded of his image. Was really known not to like to take pictures. But here we are with a treasure of pictures. I was annoyed by these errors also. It's really inexcusable. But the beautiful unseen pics made up for it. Who knew Prince took ALL of these pics!? It was rarely any new pics seen of him back then and hard to find. He was VERY guarded of his image. Was really known not to like to take pictures. But here we are with a treasure of pictures. Allen has a ton from the PR era too. Even though he wasn't the main photographer from this period. Who are the people behind Jill?